The autodestruct system is the last resort on board any Federation starships after all propulsion, weapons, and defensive systems have been disabled. The autodestruct system is intended to keep the ship, the technology, and the crew from falling into enemy hands by completely obliterating the vessel. 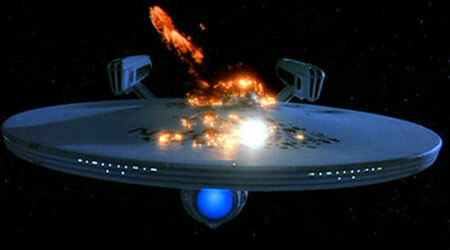 After the autodestruct command has been issued by the command crew there are two possible methods to destroy the starship. The preferred method is to override all warp engine safety interlocks and combine the entire supply of deuterium and anti-deuterium supply simultaneously. The resulting reaction has the energy of 1000 photon torpedoes completely destroying the ship. The second method is available if the computer is unable to release the matter and anti-matter supplies or the saucer section of a starship is separated. In strategically location throughout the ship ordinance packages are placed that explode simultaneously along with an overload of all fusion reaction chambers in the impulse drive. This reaction produces an explosion equivalent to 500 photon torpedoes.